"40" Lyrics by U2 from the War album. The lyrics are a modification of the Bible's Psalm 40, reflecting U2's early work which focused heavily on religious views. When played live it is often kept as an encore where the crowd finishes the song as U2 leave the stage. 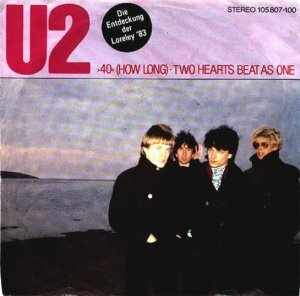 As per the single sleeve above, 40 was released with Two Hearts Beat as One. 40 is from the War album.